I have long been involved in the historical reconstruction industry, as well as being an occasional re-enactor, so figures from this period are quite close to my heart, having used , worn or made many of the items in the 1:1 world. So I have an advantage in making these miniature reconstructions, in that I understand from experience how it all goes together. I think it unlikely that commercial figures covering this early period will ever be made, so the challenge is to make everything yourself. Part of the fun comes from trying to source suitable materials to use: real wood and leather, steel, and felt can all be used; but until recently the clothing was a problem since real wool and linen are mostly too heavy to use in 1/6th. Recently I have started using Polysuede and brushed cotton "Winceyette" to imitate woolens, and have also found a source of very fine linen to make shirts from. Thus supplied, I shall be making many more figures from this period in the future. 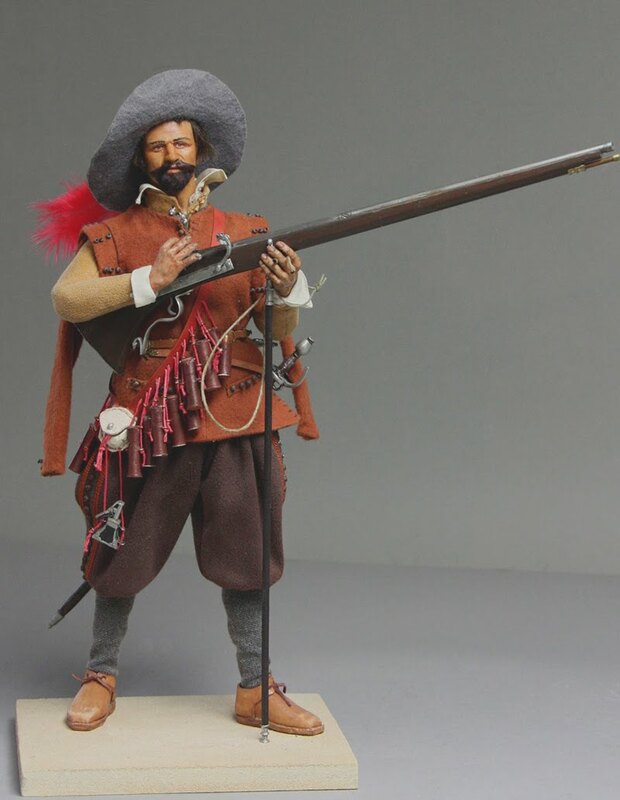 Typical of soldiers of the European wars that dragged on between 1570-1648, this figure represents a man from the Dutch Army that defended Ostend against the Spanish Army of Flanders during the Great Siege between 1601 and 1604. 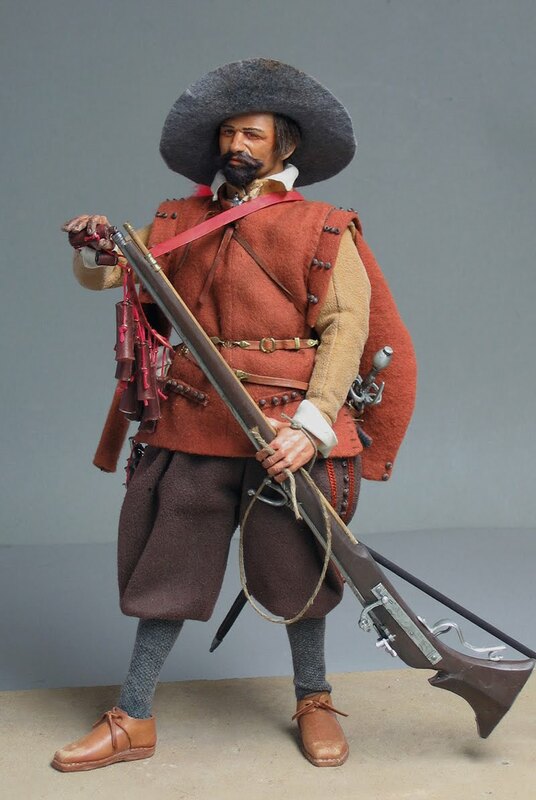 Musketeers were the commonest kind of Infantry on both sides ( see the Musketeer below ) , and they were commanded by men like this : a Sergeant. Their status was pretty high compared with that of NCOs in later armies, and such a man would be in command of a block of about 36 Musketeers, responsible for their drilling and discipline , and commanding them effectively in Siege or Field. Uniforms were in their infancy at this time : his pay allowed him to buy pretty good quality clothes and weapons. to his officers.It was also a very effective weapon. The outfit is typical of civilian clothes of the time , with a corset-like doublet, and padded breeches. in the colour of the House of Orange , and a powder flask to top up any of his men who were running short of powder. 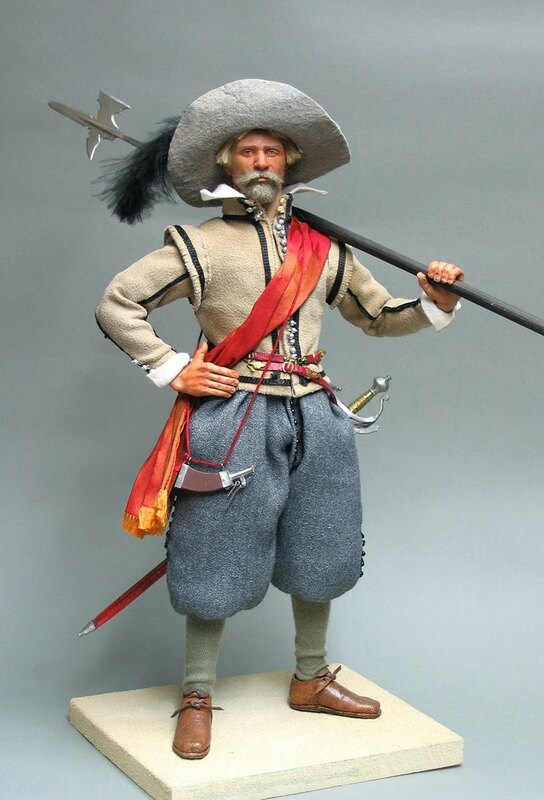 One of the Musketeers commanded by the Sergeant like the above : there was no difference between the two sides in terms of their appearance and equipment ; indeed the Spanish Army at this time contained Flemings, Italians, Germans , Irish and Scots, as well as native Spaniards , and the Dutch defenders had English and Scots as an important component of their army. 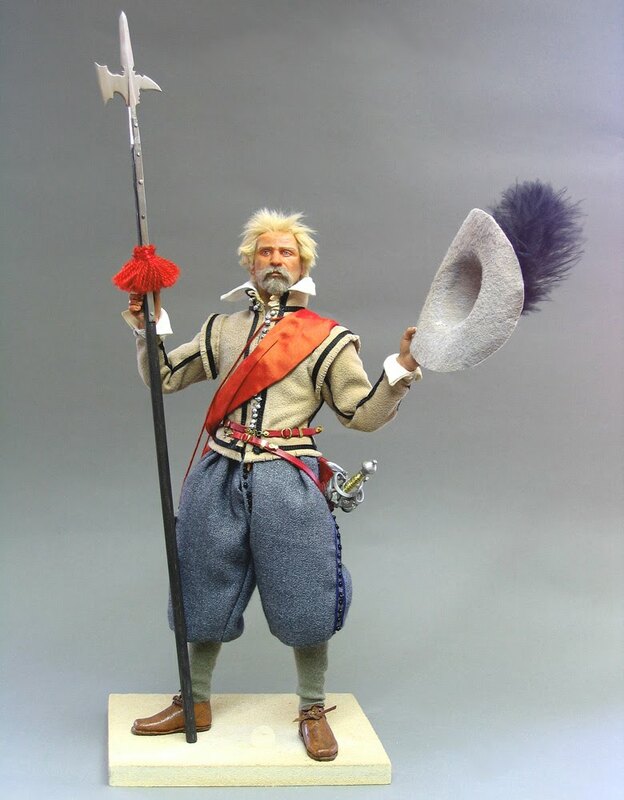 I originally made this figure as a follow-up working on an exhibition about the Siege , and he started as a Dutchman , and featured in Ransome Chua's book on 16th figures ; then I decided to rework him , after some of the early 17c paintings by various Spanish and Flemish artists. Since the 1580s when it came into general use, the large musket had become an important weapon. It outranged the smaller arquebus, and could penetrate any armour. It was developed to counter the heavily armoured French Gendarmes , and soon became the normal weapon of the infantry in all the armies of Europe , though within a generation it was shorter, lighter , and of a slightly smaller bore. Older history books , misled by the elaborate drill books published to teach its use, have suggested it was a cumbrous , slow and even ridiculous weapon. Soldiers have rarely put up with a rotten weapon ; and its success and widespread adoption might have given those authors pause for thought. Modern re-enactors have proved , that once the musketeer is trained , he can fire at least once a minute , and the effect of volleys fired by properly drilled musketeers can be devastating . 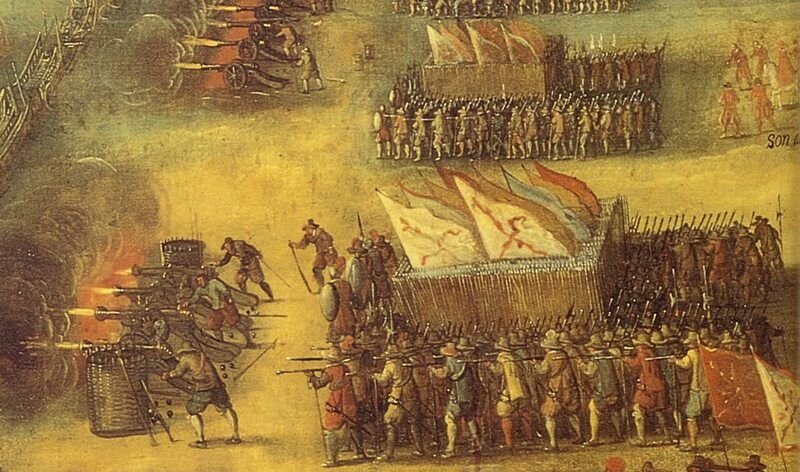 The technique can be imagined from the painting above : each rank fired then fell away to either side, the next rank stepped up and fired , with the ranks behind loading as they moved. Six or eight ranks were enough to keep up an almost continuous fire. It became a battle-winning weapon, and its successors dominated battlefields until the arrival of the rifled musket in the 1850s. A musket this size is quite a handful , and not for weaklings . Our Musketeer is partly based on the famous drillbook of de Gheyn, and partly on various contemporary paintings. He wears a doublet and padded breeches , and a brown buttoned jerkin , much used at this period . The musket is huge : 48" barrel , .86" bore , which has to be used with a rest ; and he has a bandolier of copper bottles covered in leather , with a small priming flask at the bottom. Round his waist is a set of hangers carrying a rapier. On his head , a sombrero with a feather in Spanish red. As someone wrote at the time , " a musketeer's armes defensive consist of a fair hat with a feather , and a Good Courage ". Entirely scratchbuilt , the clothing from brushed cotton and polysuede. The musket has a steel barrel , turned and filed.